Traditionally-inspired urban architecture and modern amenities blend in transitional elegance. Conducive to intimate family meals or elaborate dinner parties, the open floor plan exudes an overt sense of warmth and welcome. 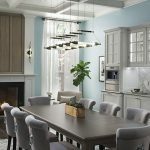 The open kitchen and living space offers the ability to adjust the ambiance of the space with well-placed lighting for memorable entertaining and socializing with family and friends. 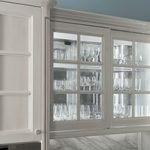 Tall cabinetry provides easy access to storage that is well lit for supplies and small appliances. 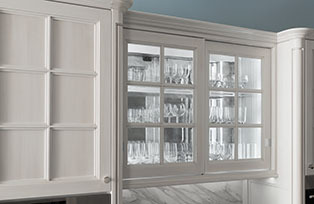 The refrigerator, freezer, steam oven, and warming drawer are integrated into the built-in wall of cabinetry. 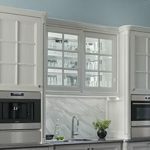 Glazed opaque finishes in Bright White and Silver Mist play off the soft neutral color scheme while the sandblasted white oak on the island, nook, tables, and mantle center panels has a look and texture of recycled wood. 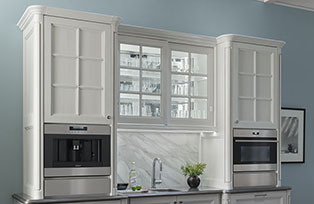 Large slab ceramic tops and back splash provide easy maintenance. On the wet bar, a metal coated counter top uniquely contrasts the vintage white base cabinetry, while sliding doors with beveled glass inserts on the center wall cabinet reveal an antique mirror backs plash, lending a touch of vintage elegance. Reinforcing a sense of history are the brass and black iron light fixtures which feature state-of-the-art LED efficiency.